I just got word of new legislation that affects Texas State Continuation of health coverage. State Continuation is a Texas State Insurance rule that allows terminated employees to choose to keep their group health insurance for a period of time after they leave employment. It is similar to COBRA in the way it works. Most all fully insured clients that are located in Texas are subject to Texas State Continuation, even if you are not subject to COBRA laws. So if you have less than 20 employees and do not have to offer COBRA, you must still offer State Continuation. A new Texas law enacted June 21, 2009, changes the way that State continuation works. Some of these changes we designed to help employees who have lost their jobs to keep their health coverage. State continuation laws apply to NON-COBRA fully insured groups, including church groups, and may also apply to certain members coming off COBRA. • Coverage remains at six months for post-COBRA (not nine months) – for example, if an employee has used up all 18 months of COBRA, they can keep their coverage for an additional 6 months under State Continuation. Also, as a reminder, I can help you outsource all of your COBRA & State Continuation administration! It never ceases to amaze me when talking to a new client and hear how their past renewals have gone. They are spending thousands of dollars a year, and most of the time benefits are their second largest expense. I’ve heard stories of last minute decisions, faxed renewals, and hands thrown up in frustration. It does not have to be this way! By following these 5 tips you can ease into the renewal process and make informed intelligent decisions. 1. Start Early – the sooner you can get started with planning your renewal, the better. Remember, there are many things that have to happen before your renewal date. You need to review your renewal and their options. If you’ve gone to the market, you need to review those options and compare them to your current plans. Once you’ve settled on a plan, you need to communicate the plans to your employees, have them fill out any paperwork, and have them return that paperwork to you. Then the carrier has to go through their final underwriting process, get your approval, load eligibility and benefits into their claims system, and mail out ID cards. Sound like a lot? It is! Your Broker should be aware of the timeframes involved and keep you on track so that you hit the deadlines. 2. Work your renewal. Your current carrier’s underwriting staff sooner than you think calculating your renewal. There are many things that you and your Broker should be doing to make sure that the Underwriters are up to date and are running plan design alternates along with the renewal. Depending on your size and the carrier you work with, optional plan designs are run at different times in the process. Your Broker should be familiar with this process and request the alternates that have been discussed during your renewal planning sessions. Once a renewal is generated, you and your Broker need to work that renewal. Make sure that changes in your employee population have been taken into account by Underwriting. If you want to try and stay with your current carrier, let them know that – if your Broker is savvy he may be able to get you some rate relief by asking the Carrier the right questions and performing a little negotiation. In the event of a big renewal increase, you need to review your alternate plans. Your Broker should know your company well enough to suggest options that fit your philosophy and still save some premium. Of course, all this hinges on starting early! You want to have the time to go through this process and not be rushed into a decision. 3. Get Informed. A recent Texas Law has given smaller employers some very important tools to help the renewal process. Before this law, an employer group had to either self-fund their benefits or have at least 100 employees to get any real data on how their plan was running. With the new laws, if an employer asks correctly, carriers must provide month-by-month premium, life counts, and claims paid. In addition, the carrier must provide information on any claims in excess of $15,000. If he is up to date on the new rules, your Broker can guide you through the process of getting this information. 4. Make a plan. You should not just jump into the renewal process. A successful renewal begins with a good plan. You should know the dates of your renewal and have a timeline of what should happen and when. Before the renewal is even calculated, you should have an idea of what alternatives you have in case of a large rate increase. 5. Tie it together. You may have several benefit plans through several different carriers. One company may handle your health, another may handle your dental plan, and yet another may handle your life and disability. Over time, these plans may get disjointed and renew on different dates. Part of the renewal process should involve reviewing all of these plans to make sure they still work together and fit your goals. Does your dental plan renew in April and your medical plan renew in May? There are ways your Broker can negotiate a solution for this. Review plans to see if they can be combined with one carrier – you can sometimes negotiate multi line discounts and save administrative time. These are just a few of the things that can help your renewal process run much smoother. Careful planning, having good data, getting started early, working your renewal, and staying on track are key to a successful plan renewal. Our Texas Congressman Kevin Brady is trying to let us know how the proposed health reform will work. Part of his efforts have centered around creating a one-page snapshot of how the proposed plan works. He is getting steamrolled. 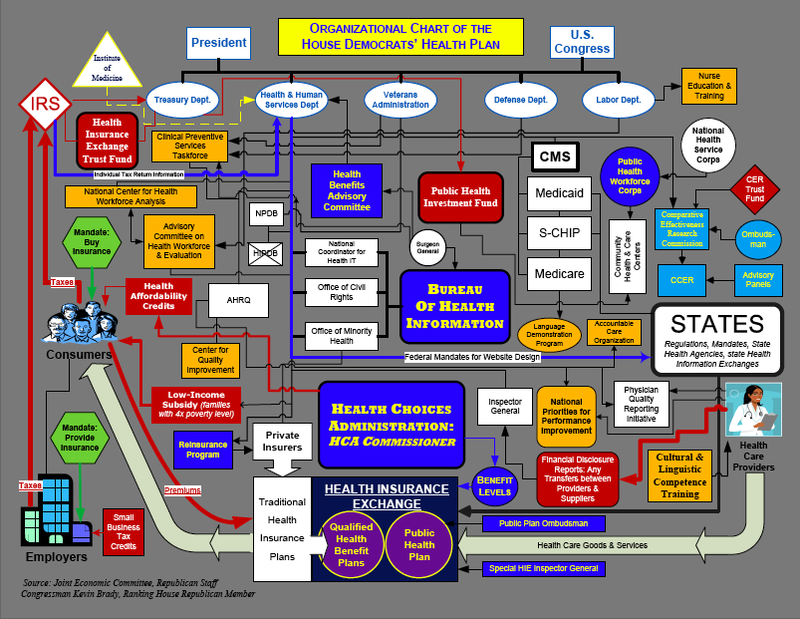 The Powers that Be in Congress don’t want details getting out, and Mr. Brady’s chart shows detail. In fact, he is being censored by the Democrats – click HERE read a Washington Post article about it. The chart has so much detail it is really hard to follow! That is part of Kevin Brady’s point – this legislation is very, very complicated and has a lot of moving parts. Friends, we are at a crossroads with Health Care Reform and Government in general – big things are happening in our country with legislation, government oversight, and government control. With that said, I want to begin keeping you updated on what is going on with health reform, written from my perspective as a benefits professional . Portability – I still see people who leave their jobs and employer sponsored health plan get declined for individual insurance. There are times when people get in a bind for coverage if they have a pre-existing condition and either can’t afford COBRA or COBRA runs out. We need to address individual medical plans giving credit for prior coverage and credit for pre-existing conditions if the applicant is moving from one health plan to another. Pricing/Underwriting control. Here in Texas, employers that have 2-50 employees have rules that protect them. They must be given a proposal for insurance. They cannot be declined for coverage. There is a maximum percentage the rates can be increased at final underwriting. They can request detailed claims reports on how their plan is running. I think that some of these rules, and other good rules like this in other states, should be adopted on a Federal level to help all size employers with their insurance. COBRA and Medicare. I’ve seen many employers get into situations where 1 or 2 employees with medical conditions keep that employer from getting affordable health plans, or even alternate proposals. We need to give those employers a way to get options and control their exposure – this can be done with Medicare rules, reinsurance, or other legislation. Early retirees – employees who retire prior to age 65 (Medicare age) have a real hard time finding affordable health coverage. If an employee retires at 55, COBRA will only cover them for 18-36 months. So that person will still need insurance, and the medical premiums are really high. Carriers are trying to create programs to address this, but legislation might help. Government assistance with large claimants. As a follow up to #2, many employer’s health plans get hit with huge increases and limited options because of an employee who has an expensive ongoing medical condition. What about having the government step in to help pay these claims, and get them off the books for the employer/insurance carrier? All the government has to do is provide a reinsurance policy to pay these claims. They could set up a plan that when anyone goes over say $50,000 in claims, the government steps in an picks up the rest of the tab. The insurance company would still be responsible for watching that claim to make sure all discounts are applied and there is no abuse of the program, and legislation can require this. The government could also legislate insurance pricing to prevent carriers from taking advantage of the relief. This would take the pressure off of employers and help with renewals. We need legislation, we don’t need a Public Plan option. Congress says a “public plan” will keep the insurance carriers on their toes to control profits. The Public Plan will compete with the Insurance Companies in the marketplace. Congress is saying that this competition will lower the cost because insurors will have to trim the fat from profits. The problem is, Congress is proposing legislation to eliminate underwriting factors that help control cost, which makes it difficult or impossible for insurors to correctly price the health coverage. The insurance companies can only lose so much before they start going out of business, because they have limited funds and depend on the public buying their plans. The Public Plan does not have this issue – if the Public Plan starts going belly up, the government just gets more money from taxpayers. So the Public Plan can keep going after all their competitors have gone out of business, and guess what? At that point there is a “single payor” and one choice for your healthcare – the Federal Government. (Reuters) – Here are major provisions of the U.S. House of Representatives’ healthcare plan introduced by Democratic leaders on Tuesday. * Creates an insurance exchange through which individuals and small businesses could shop among private companies and a new government-run plan for insurance policies. States may offer their own exchange or join with other states to create an exchange. * Creates a government health plan that would be offered through the exchange and compete with insurance companies. * Both the exchanges and the new government health insurance would start in 2013. * Creates an independent agency, the Health Choices Administration, within the White House to work with states to oversee the proposed new health insurance exchange and set benefit standards. * Insurers would be barred from excluding coverage for those with pre-existing medical conditions. * Higher penalties for insurers that give false information to Medicare. * Congressional aides said about 9 million people would be insured by the public plan, with 21 million insured by private companies in the exchange by 2019. * Another 164 million would be insured through their employers. * Employers would be required to offer health benefits to workers or pay a tax based on payroll. Exemptions and tax credits would be available for small businesses. * Legal U.S. residents be would be required to enroll in health insurance or face an income tax penalty of 2.5 percent. The bill would allow some exemptions. * Government subsidies provided for premiums and cost-sharing on a sliding scale up to 400 percent of poverty. * Taxes on wealthy would raise $544 billion over ten years. * Additional tax of 1 percent on income for couples above $350,000, 1.5 percent above $500,000, 5.4 percent over $1 million. * Triggers a higher rates in 2013 of 2.0 percent for those above $350,000 income and 3 percent for those above $500,000. * Medicare Advantage plans, private insurers who operate Medicare plans in some areas, would have a “quality performance score” starting in 2010. * Medicare Advantage plans would face reporting requirements for quality of care by 2013. * Quality assessments may include hospital readmission rates, patient mortality after surgery, survival for patients with chronic diseases. * Government would publish “medical loss ratios” of Medicare Advantage plans. * Expands Medicaid health care for the poor and long-term disabled to all non-elderly with incomes up to 133 percent of the federal poverty level. * Newborns without insurance would automatically be enrolled in Medicaid for 60 days while their eligibility is decided. * Medicaid payment rates would increase. * Drug companies would be required to give rebates for medicines to Medicare and Medicaid patients. * New measures to close the gap in drug coverage in Medicare. * Center would research the effectiveness of drugs, medical tests, surgical procedures and other medical treatments. * Center would have the power to collect data, both published and unpublished, to study medical treatments. * New commission of healthcare companies, drug companies, patients, and others would oversee the center’s work.